This recipe takes about 30 minutes to complete. You can definitely eat any leftovers the next day. 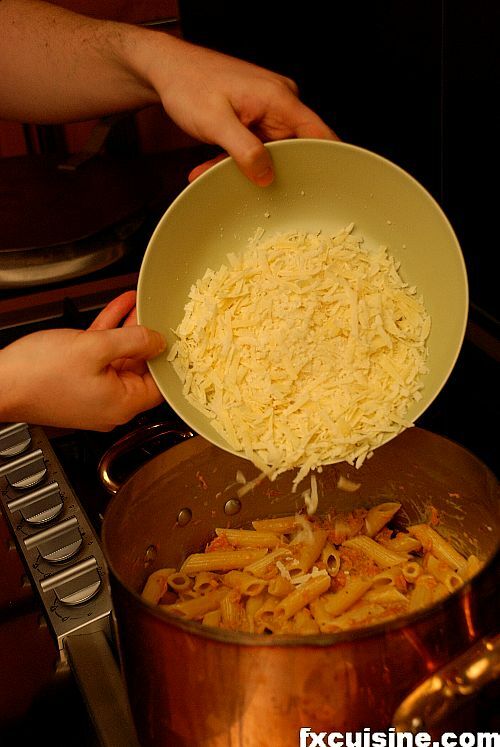 * Penne are short tubular pasta cut at an angle. See pictures. You can also use macheroni or any short, tubular, dry pasta. Don't let the shop take advantage of you and buy only pasta trafilata al bronzo (it will say it on the box) and made from semolina flour. If the pasta is smooth and shiny, that's not it. Peel pumpkin and onions. Remove soft flesh and seeds from pumpkin. Put a chopping board. The fun begins. 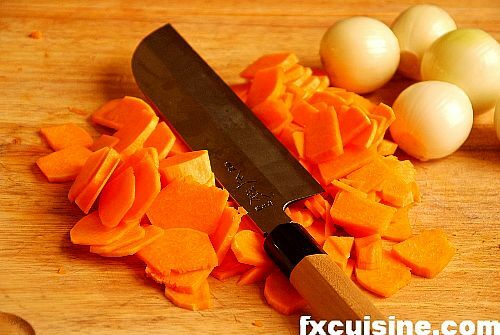 Chop the pumpkin in very thin slices, never larger than a matchstick. You can also cut them in little matchsticks but that is a lot of work. It will look better but the taste is not affected. Next cut peeled onions in half and then in thin slices. My Japanese vegetable knife is so sharp I couldn't take the picture while chopping, hence the artificial-looking picture. 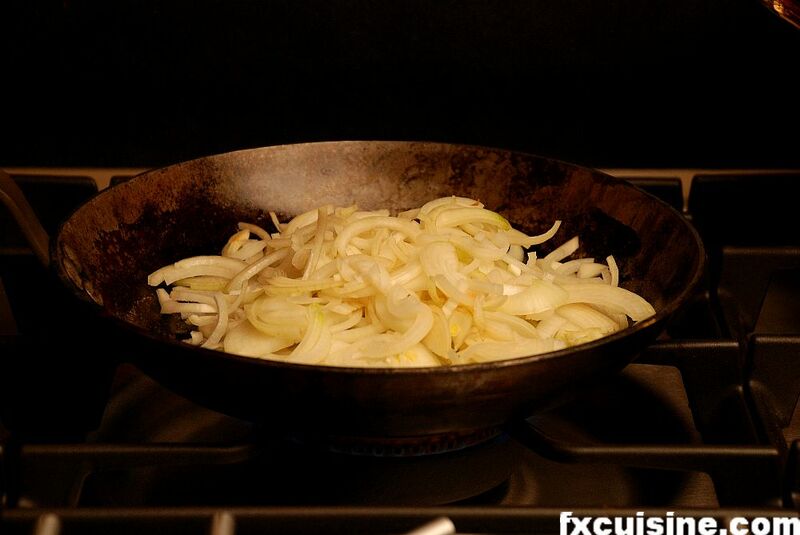 In the heaviest saucepan you have heat a drop of olive oil or butter and add the onion. Sauté over medium-high heat until soft but not brown, about 5 minutes. 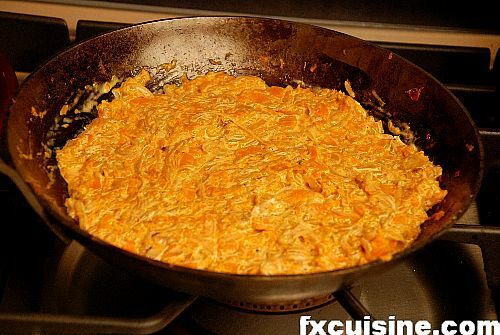 Add the chopped pumpkin and mix. 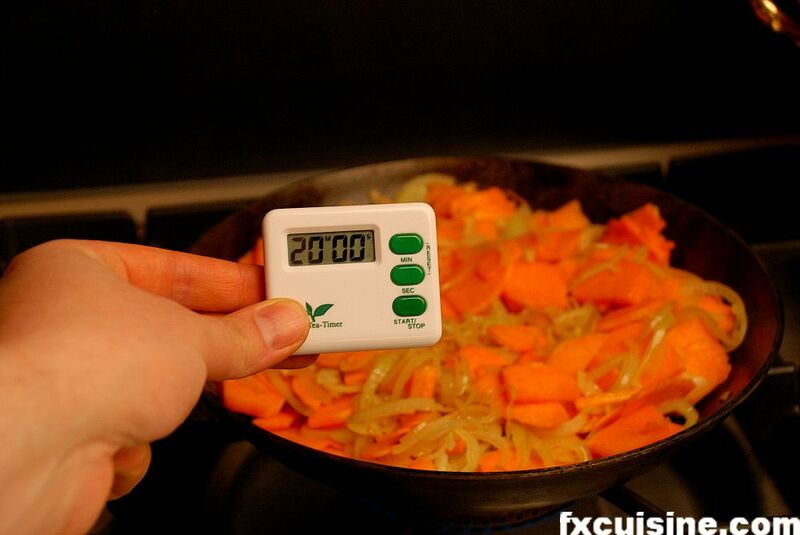 Lower temperature to medium-low and cookfor 20 minutes or as long as it takes to get a soft, mushy consistence for both the onions and the pumpkin, turning regularly. The pumpkin and onion will finally admit to the obvious - they are both full of water. After 20 minutes most of it will have evaporated and they will be reduced by half and nicely browned. 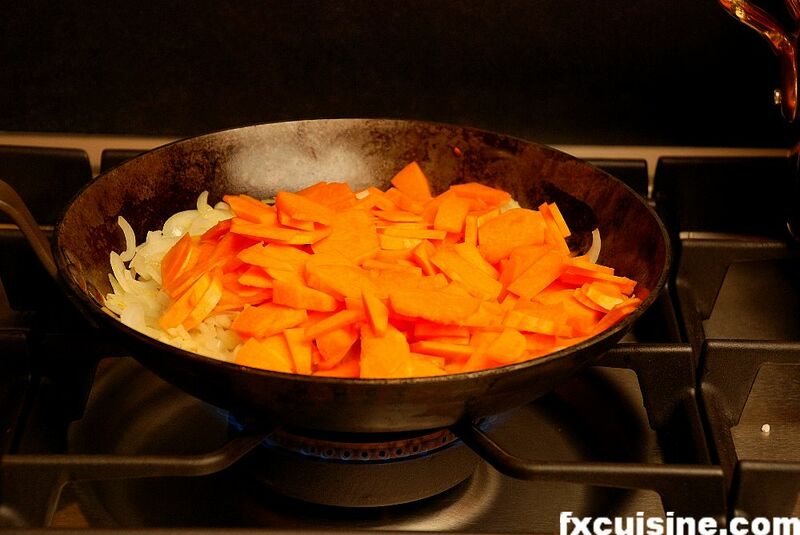 This process concentrates the sweet flavor of both these vegetables and adds a caramelized flavor from the browning. Grate some nutmeg and add black pepper. I recommend no salt at all at this stage as the parmesan will bring much salt later. Remove the saucepan from the fire and add half a cup heavy cream. 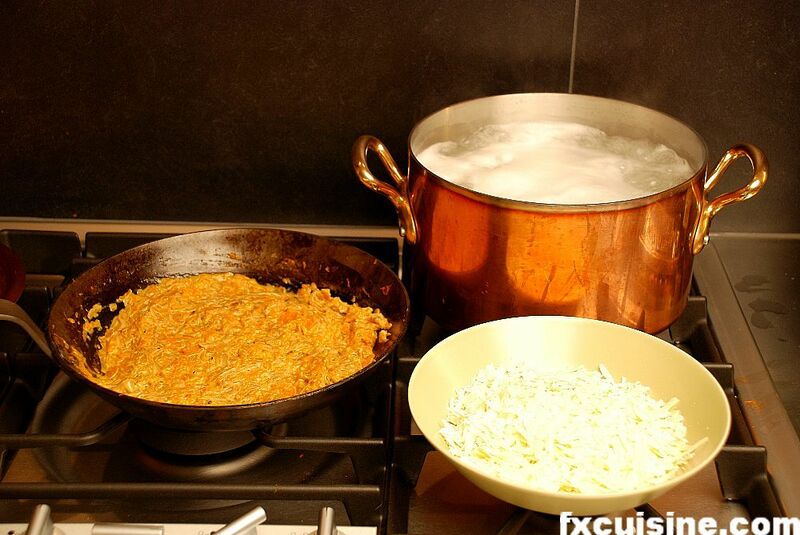 Mix and leave aside until the pasta is cooked. Do not salt. In the very largest pot you own you will have brought to a boil water with salt. Don't add any oil, no matter what your mama told you. 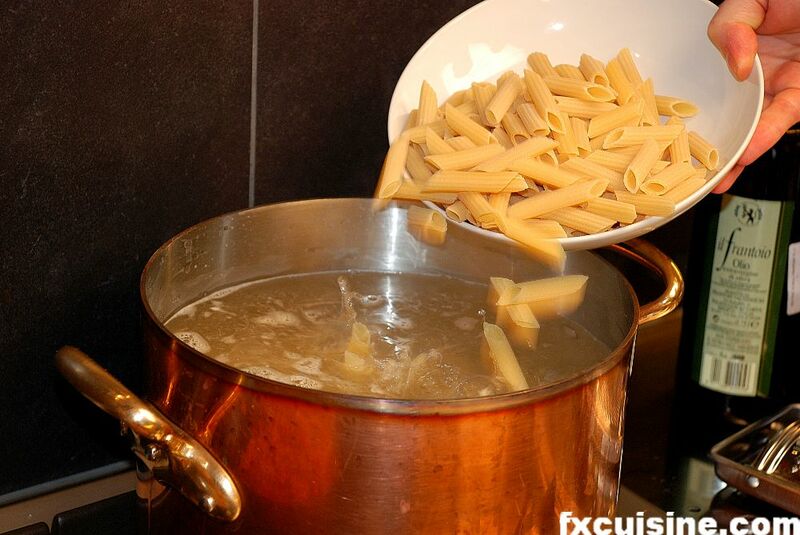 Pour the pasta in one go in the boiling water, and whatever happens, do not cover the pot. Set your timer to 75% of the cooking time indicated on the box. 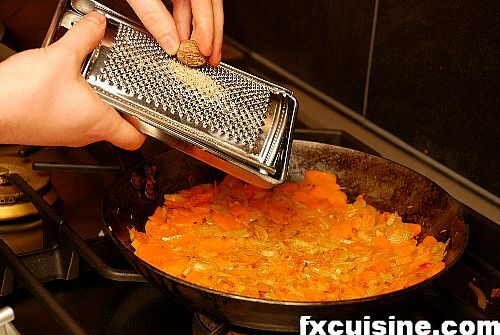 Coarsely grate the parmesan and set it aside next to the saucepan. When the pasta is almost al dente, meaning it is still too crunchy to serve but you reckon it would be perfect if you leave it 2 more minutes in the boiling water, take the pasta out and pour the water in the drain. Do not rinse the pasta. Just put it in a heated serving dish or, like I did, back in the pot. Add the sauce and mix. Call your guests to the table, then add the parmesan, mix and check the seasoning. You can add pepper, nutmeg or fine salt if needed. The pasta will continue to cook in the sauce and by its own retained heat during this process so you can't wait before serving it unless you want it overcooked, swiss-german style. 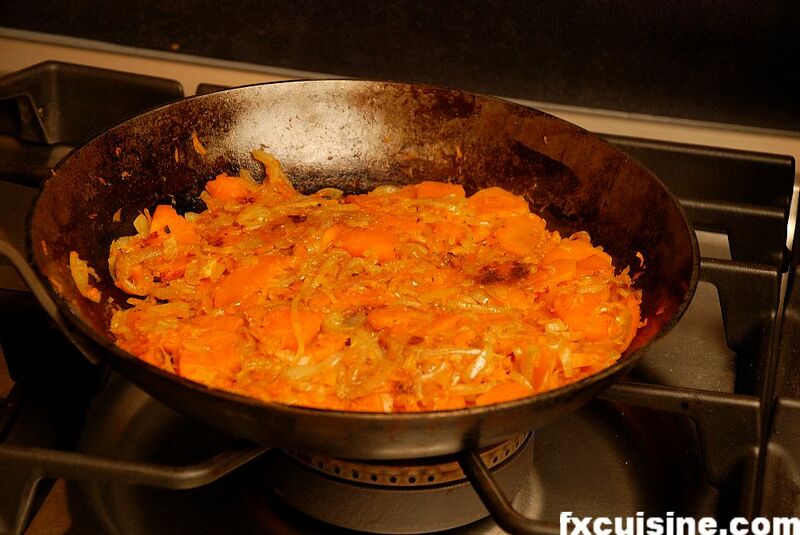 The sauce is rich but easily digestible as most of it is vegetable. It is a compelling combination of the slowly browned onions and pumpkins, which brings out an almost fudgy sweetness, and the darker, salty tones of the parmesan and nutmeg. I believe it is a traditional Italian recipe and I originally found it in an Italian cookbook in Italian. Great photos & the pasta looks yummy! Cheers! Thx, fx. I will make this treat the best I can for my pasta-loving but vegetarian wife. Can I substitute the cream with low-fat blender-zapped paneer or will that ruin it? Parshu, I don't think paneer will cut it. Maybe just omit the cream altogether or substitute with a tablespoon of the least acidic yoghurt you can find. The main point is the Parmesan. FX! I just found your website about 2 hours ago and have been reading and reading and reading.... it's wonderful. I am in the food business, but never get tired of cooking. Truly one of the greatest ways to spend time ever invented! Thank you. Merci beaucoups - I have bookmarked you and plan to try one or 2 of your recipes next weekend... I already knew I wanted to make Foie Gras for the first time ever. I'll have to decide if the Livers I got are good enough to grill. Thanks!!!! Tortelloni filled with amaretti and pumpkin has always been one of my favorites... parboiled and slightly flash seared on a pan (for about... 1 minute?) and DELISH. Wow. I just saw that you have a recipe for the tortelloni with amaretti already. You are the MAN! Hova, with this particular recipe I think the amaretti would work well, but definitely not the sage. I've been surfing your site quite a bit since I've come accross it and this has been the first recipe I tried. I ended up making it last night after finding a pumpkin at the local supermarket- I ammended the quantities of cream/parmesan a bit and it was trully lovely- am looking forward to digging into the leftovers when I get back home. 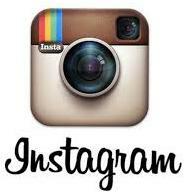 Also want to compliment you on the site- it's excellent; everything from the recipes to the photography- bravo! Magda, thanks for trying this recipe! You should also look into my Pumpkin Risotto and the Pumpkin tortellini if you like them pumpkins! 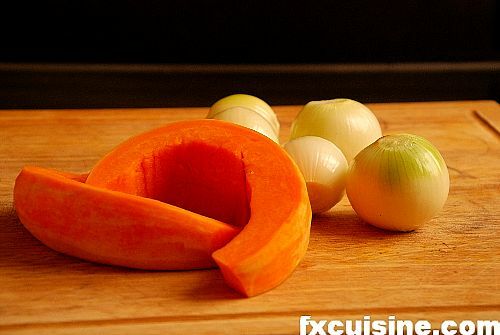 For those who love pumpkin, www.epicurious.com has a wonderful recipe for pumpkin/shrimp bisque. It takes some time to prepare but it's worth the effort. This recipe, too, looks like a keeper and perfect fare for autumnal evenings. Thanks. Michigan, thanks for dropping in! 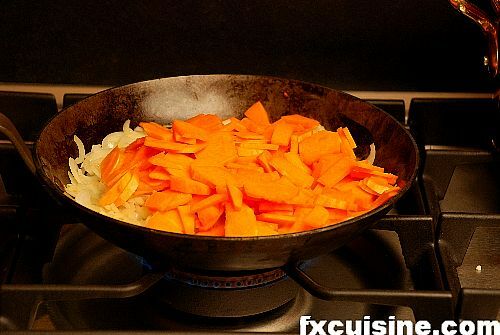 This one recipe is very simple and you can prepare it in less than 30 minutes, most of which spent watching TV while the sauce simmers. Loved your recipe, although i tweaked it with a dash of curry and coconut milk instead of cream then topped it with roasted pine nuts..delicious..kudos to you..
FX's answer→ Thanks for trying this, Kim! Just made this, and will definitely be making it again and again! FX's answer→ Jan, glad this worked for you! I cooked this recipe for a Thanksgiving dinner party, and WOW!! Everyone thought it was amazing, couldn't complement me enough; I was even impressed with myself! FX, THANK YOU for making me look so good to my guests. I can't get over how easy the recipe was, too. Trust me, I told everyone about your website - when I find something this good I spread the word. FX's answer→ Jill, I am so glad my recipes worked for you and that you let me know how they went! This recipe I do a couple times every year, very nice indeed, and it is indeed easy. Great food doesn't need to be complicated and a hearty pasta dish cooked with fine ingredients can be way more memorable than artsy pretentious expensive designer food. Thanks for trying my recipes! I also made this recipe for Thanksgiving week, twice, and it was very good! It has an interesting flavor: slightly sweet, a little nutty, and rather rich. My penne sauce actually could have used a little more flavor. I think I was a little too easy with the cheese & spices. Still, an excellent addition to my holiday repertoire! 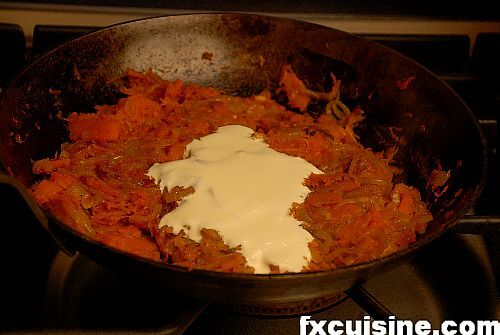 My sister said that she makes something similar with butternut squash. FX's answer→ Meramarina, you can season this with freshly crushed white pepper, freshly grated nutmeg and freshly grated Parmesan right before serving. You can even add those spices on the table so that each guests can make the dish worth his taste. This is a real seasonal treat with humble ingredients . 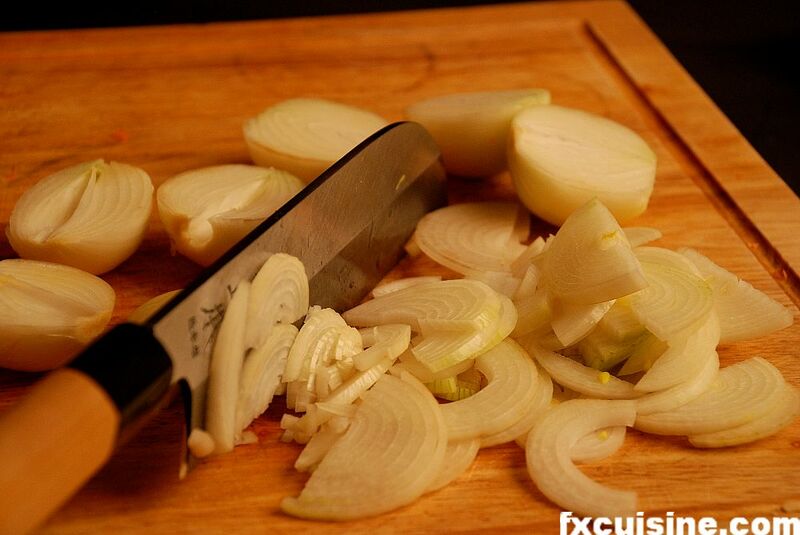 FX's answer→ It is delicious, I have all the ingredients in my fridge as I write this and will cook it tomorrow! If you can't find a fresh pumpkin can you use canned pumpkin puree instead? And if so how much can you use? This sounds so delicious. FX's answer→ Juanita, pleeeeeeease do not use canned pumpkins. Do some other recipe if you can't find an actual pumpkin. Here there are huge piles of pumpkins on the roadside and you leave the money in a till! We made this last night as the entree for our Pumpkin-themed dinner along with a light Japanese pumpkin soup, a pumpkin spread on hearty bread with Gouda, and an almond cream cheese pumpkin roll for dessert. 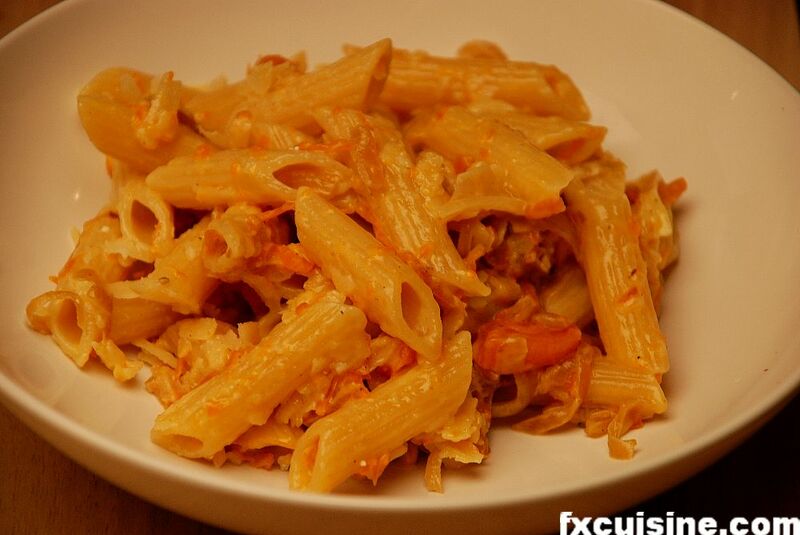 This penne had a great balance of flavors, none of which were overpowering. Very very delicious. We plan on making it again soon! 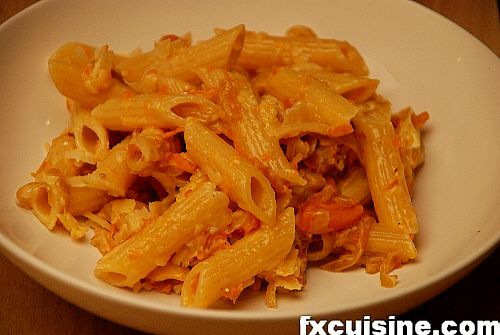 This recipe is much better than other pumpkin penne recipes that I have tried where the result is bland and boring. This one is quite the opposite! Thank you so much for this! FX's answer→ Thanks for you confidence in FXcuisine.com - you made my little dish the pièce de résistance of a fine pumpkin meal! If fresh pumpkins are not around could i use canned pumpkin ? FX's answer→ No, I would rather stick a spaghetto in my eye than eat canned pumpkins. Just cook something else that calls for ingredients you can find and keep this for the future when you find a real pumpkin. I love pumpkin, here in australia we love ours. This is a really easy and quick meal to make, my kids love it and I found your site by accident, I needed to use a pumpkin as it was spending too much time in the fridge! Great tastes sublime. I'm making this tonight (Christmas Eve). I was so fortunate to find a pumpkin in our grocery store (we live in Arizona-not common)...I'll let you know how it goes...I am so excited as there are two of us, vegetarians...and this sounds elegant enough for our holiday dinner. Thank you! Great site! FX's answer→ Bridget, I hope your Christmas dinner went well! Sensational pumpkin sauce ! Found you on google trying to make a pumpkin sauce. Didi it exactly as per your fantastic guide and ever so clear pictures which really give one the feeling and idea of each step in the process. Of course having enjoyed this so much I have now discovered your web site and can say I have become a follower - there are so many great things to try - thank you so much, from Australia (with Austrian and Argentinian blood - I enjoy food of all sorts like you!). FX's answer→ Paul, I am glad to hear this worked for you. Ineed there are many more recipes for you to discover here and - hopefully - had to your list of home classics. Have fun! FX's answer→ Brittany, perhaps you could leave the cream out and just add a little butter and parmigianoI suppose. But for one who writes about French pastry, is it really all that bad to add a couple tablespoons of cream? Great recipe - thank you! My big revelation was reading this and realising that fresh pumpkin, a cheap vegetable all year round here in Melbourne, Australia (I include it in my dog's meals - she loves it) is unavailable in some places. I don't think I've ever seen canned pumpkin in my life. Thanks, I just found your website. We had an Iron Chef cook off and pumpkin was the secret ingredient. It was easy to cook in the hour time slot, and we destroyed the other 5 teams. One of the judges was a chef and could not stop eating it. It is now a family favorite. A very nice recipe, that I'll try this evening. BUT: limp penne = swiss-german style? 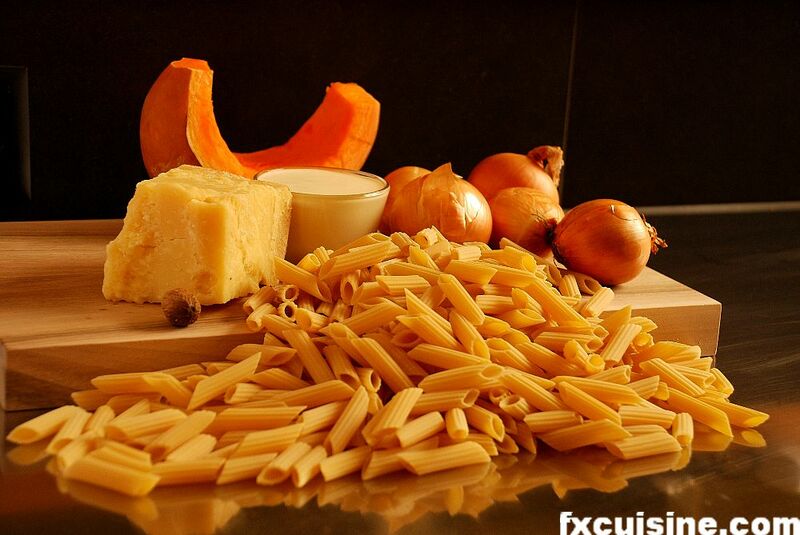 where in Switzerland have you been eating penne? Must have been a very bad restaurant. My and my friends penne are always al dente. Italy being the country we spent our holidays from a very early age on, we know how penne and co are supposed to taste. FX's answer→ Swiss Miss, I apologize for this negative generalization that is all too common in our parts of Switzerland - we like to think that our Swiss-German-speaking countrymen like to overcook pasta. But of course that does not include fine foodies like yourself! I too am from Australia and am so glad that pumpking is available all year round here because I love it. This recipe is delicious however, if I'd had some baby spinach leaves on hand, I would have tossed them in for the colour. Love your site, have bookmarked it for frequent reading. 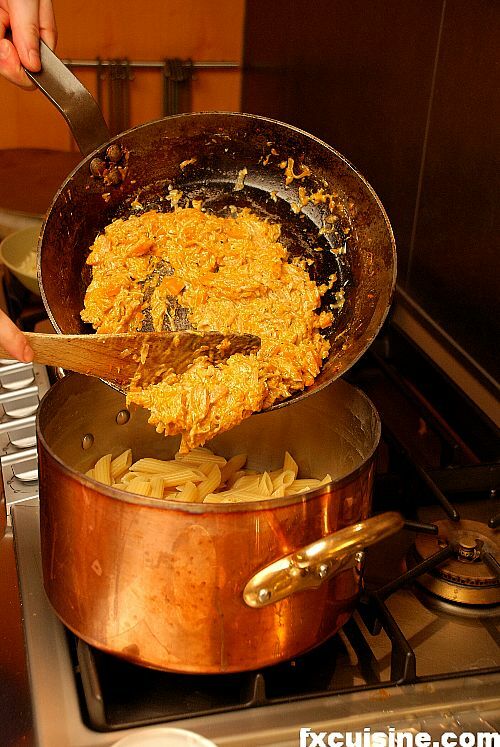 I found this recipe three years ago and tried it back then... it's the only pumpkin sauce pasta I make now! I make it exactly as directed, and it works so very well. Thanks for keeping this link live. I don't know how to change the recipe grams for pumpkin, pasta and parmesan. How many cups do they amount to? Wondering if the sauce would hold up well if made ahead. Trying to get a jump on Thanksgiving dinner for a fairly large gathering. I was looking for a main dish for the non meat eaters. I have to admit I'm usually a traditional turkey dinner person, but i am very excited to taste this dish. FX's answer→ I think you could even freeze it if needed, just make sure no campilobacter transfers from the turkey arrive on the lukewarm sauce or you'll make the guests run to the bathroom. I would add the cream and parmesan at the last minute. My daughter ask for pumpkins sauce pasta as I Google I found only you have fresh pumpkins ingredient yet. Thank you. FX's answer→ I hope this worked for you! I made this last night - and am eating left overs in the office now - it is YUM. I made a couple changes though. I changed the cream to ricotta mixed with a little pasta water and added some chopped flat leaf parsley. As a southern italian I can bear to eat pasta with creeam and I just felt it needed some green(for the taste not the look) - thanks FX!! FX's answer→ I think ricotta is a great idea, and why not herbs. Glad you had fun! FX's answer→ Same here I grow several hundred kilos of pumpkins every year for my own use and now in march I'm left with about 50kg. you can substitute almond milk or even coconut cream for the dairy cream. 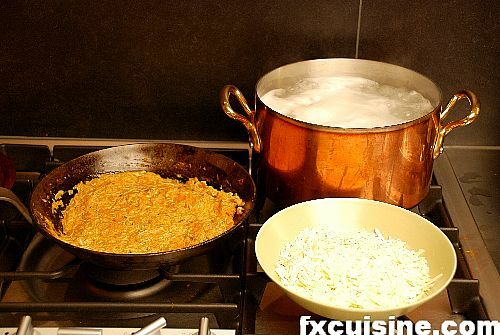 Also if the sauce is too stiff, retain some of the pasta cooking water to slacken it as the Italians do. FX's answer→ Sure you can, great idea! I added a little balsamic & walnuts- thank you so much for the tasty recipe! FX's answer→ And why not? Thanks for your visit! Hi would love to try this recipe from scratch, just as you've outlined, but I'm not sure what type of pumpkin to buy and or how to tell the difference. Could you assist me with that? Once I have the exact type of pumpkin, I'm sure i can find it. Thanks! 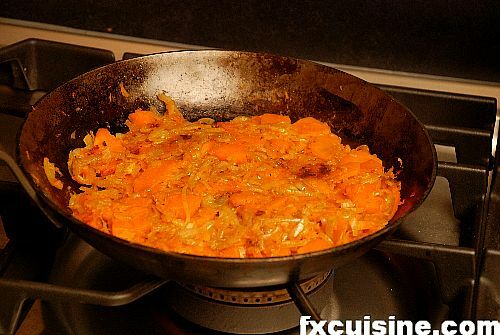 FX's answer→ Well you could use several types, I like various cultivars of cucurbita moschata (croocknecks). Good luck! Honestly, I do love the way you explained every single step with a dash of humor as well! Good one :) Keep on!